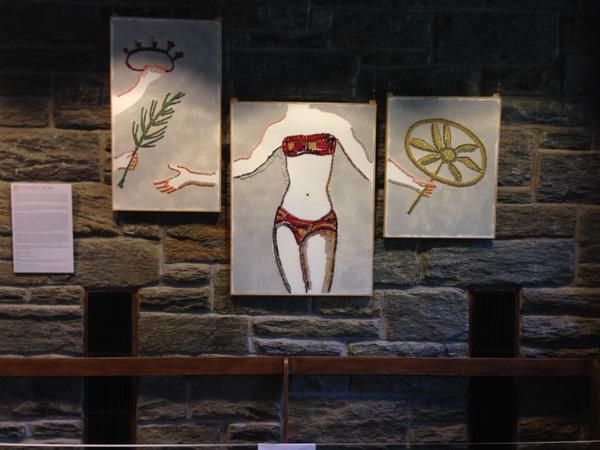 Located in McCabe Library, the Science Center, and even the Matchbox, Angela Lorenz’s “Victorious Secret” is currently being held as an exhibition consisting of three triptychs, which in total feature nine different images. This particular manner of organization was inspired by a thematic sequence that was also used in Siciliy at 300 A.D. Upon first glance, it appears that the images depict dancing girls in bikinis: it is this exact interpretation that Lorenz is trying to achieve. After looking at them for a little longer, maybe even with the help of the artist’s purpose in mind, we realize that we have obviously misinterpreted these images (a misinterpretation that occurs more often than we are willing to admit). No, these are not dancing girls in bikinis: they are elite athletes. Through her artwork, Lorenz is trying to bring attention to the way that people often dismiss women as beings that are beautiful, silly, and weak and the objectification that occurs when we view women. Many women seem to be acknowledged more for their physiques rather than their accomplishments. Lorenz shaped the viewer’s perception of the images through her choice of material. “To highlight the misguided readings of these images, I have reconstructed them with materials associated with women and ornamental dress: hairpins and buttons attached to a faux-cement ground with a metal frame, creating the semblance of a mosaic fragment,” Lorenz said. Furthermore, she explains that she purposely removed the women’s faces, deciding only to focus on their torsos in an effort to mimic the ways in which these women have been objectified. The name of the collection itself embodies the central focus of the work. Many believe that the title is a reference to the lingerie-selling company Victoria’s Secret, but closer study of the name shines light onto a different understanding. “Victorious Secret” is meant to illustrate the strength and power of these particular women, celebrate the 40th anniversary of Title IX, and, more broadly, exemplify the strength of women as a whole. The history of these mosaics begins at Dartmouth College in 2013. Since then, they have been circulating through colleges and universities, eventually finding another temporary home at our own Swarthmore community. Of their journey, Lorenz said, “In exhibiting the mosaics at schools my goal is to place them in areas with a lot of student foot traffic, to transmit this message about goals for women in elite sports 2000 years ago to young people that don’t necessarily make it into university art museums.” It seems that Lorenz has achieved her goal at Swarthmore. The artwork has already spurred many conversations, especially in the Science Center. One student asked, “I don’t get it. Is it something Victoria’s Secret?” Like many, this student was taken aback by the scantily clad women, first believing that this piece itself was objectifying women. Lorenz is empowering women of the now and past through her creative and innovative work. Beyond our initial perception of “Victorious Secret,” there are many more layers of meaning at work that hope to deconstruct the very understandings that people have of these pieces at first glance. Anna Garner is a freshman from Mercer, Pennsylvania and works as the Assistant Opinions Editor for The Daily Gazette. She is a member of the Kitao Galley board and works as a tour guide for admissions. Anna is a potential English literature/ political science double major. She loves watching CNN. Her favorite band is Mumford and Sons and favorite film is Blue Valentine. She joined The Daily Gazette because she has always had a love of news, writing, and politics. Anna had never previously worked for a newspaper.